The story of Moore Clean, LLC has its roots in where Jose Moore went to college. Although the company’s founder describes Abilene Christian University as a great place to gain a college education, he cites it also as being very expensive. As a result, when Moore got finished with school and moved to Austin with his wife, Laura, he needed a job. Initially, he worked in the area’s district office for the Boy Scouts of America. Laura had a job working as a staffer in the governor’s office for George W. Bush. Unfortunately, the combination of an entry-level government job with that of a nonprofit salary wasn’t enough to allow the couple to live comfortably in the high-priced Austin area, especially after their first child arrived a year later. Initially, Jose went to work for a sweeping company in order to subsidize their income. With his input, the business grew significantly in a short amount of time. This spurred a joint venture between the owner and Moore to spin off a division of the company that would specialize in oil spill cleanup. However, this venture ultimately didn’t come to fruition and Moore ended up starting his own sweeping company in May of 2001. Since they did have a total of $3500 to their names the couple decided they should buy a sweeper. This turned out to be, as Jose called it, “an old Sanford and Sons TYMCO 600.” They soon learned this venerable street sweeper was one of the most inefficient ways to sweep a parking lot. Fortunately, due to the quality the couple produced for its customers, the business grew quickly to the point where the Moores realized if they down-sized for awhile they could leave their existing jobs and put all their efforts into their fledgling Moore Clean company. With its success, the company has continued to expand its scope of operation significantly in the Greater Austin area and, recently, into the San Antonio market. Currently, Moore Clean has a total of 30 employees and — especially around high-growth Austin — there’s still room to grow. Moore says the market has proven to be a profitable one. Growth in customers has largely come via word-of-mouth, since at the beginning there wasn’t any money for an advertising budget, website or any other type of promo. That’s saying something in Austin, which is a high-tech haven with many people primarily finding companies via online searching. The couple also emphasized ‘educated cold-calling’ in which they did their homework to know who to call and had knowledge about the center prior to making their contact with property managers. Recognizing that they could be more cost-effective when they had multiple clients within a mile of each other, the pair targeted nearby prospects wherever they gained a customer. Then, in 2006 with the launch of the MooreCleanTexas.com website, Jose says the business really took off. As Moore Clean grew, the couple started to see a shift in their potential clients, as well. 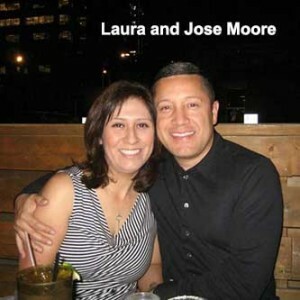 “Our initial clients were fine with having a ‘Jose and Laura’ sweeping service,” said Moore. “However, we realized if we offered more services we could become attractive to larger-scale prospects, so we started doing porter services and power washing. Moore said when they started out in sweeping he and Laura underestimated the large demand property managers would have for their sweeping company to perform general property maintenance. Given the demand, this part of the Moore Clean business has skyrocketed over time. “Property managers have an enormous demand for us to come onsite and do the little things, like graffiti removal, stop sign repair, handicap signage; the many small jobs that construction companies don’t want to perform. When we started including those services we found that people began knocking on our doors for those kinds of jobs. “This addition made us much more competitive. Property managers have a million things to do, and when they can have one company come in and do their sweeping, their pressure washing, window cleaning, minor repairs and more, you become their go-to company to call. Otherwise they can spend half-a-day just trying to find someone to put up a stop sign. Another advantage the Moores have seen is that, by having their workers on the jobsite, they end up with more sets of eyes on the properties to see if anything else might be amiss, including confirming that their sweeper operator is doing a great job. 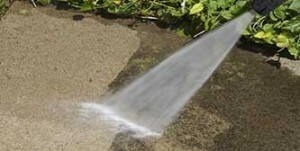 Moore Clean started doing residential work in addition to commercial properties when a demand started surfacing. That brought them to the realization that, with residential work, they could keep equipment like power washers working both by day and by night. Jose said they were astonished when they did the math and realized they were leaving close to a million dollars a year on the table because of not co-utilizing their manpower and current equipment during the day with residential customers. Along with property maintenance, Moore Clean also provides construction sweeping via its use of Schwarze Gale Force sweepers. Austin is an area that’s very aggressive when it comes to ‘staying green,’ and the company gets many calls from construction firms that need dust control. Many have broom machines, like Broce Brooms, but they don’t pick up the dust but, rather, just push material around and make dust in the process. Code enforcement officers in the Austin area, says Moore, often require a receipt from construction firms showing that a jobsite has been swept with an air sweeper. Moore has also found that, when they sweep for construction companies during the building phase of a project, oftentimes they are referred for the sweeping of the finished property. That generates additional business with no marketing expense outlay. Jose Moore’s top choice for a sweeper has become the Gale Force, because of what they’ve seen of its versatility in both day-and-night usage. He also praised the company’s customer service, both in the area of parts ordering and when he buys his sweepers. Moore says they are one of the highest paying sweeping company’s in their market area when it comes to employees, so they have very little turnover. When they do need additional employees, though, they first announce the position to their current employees at their monthly safety meeting where everyone’s present. That has been the best method to get qualified employees to date. These types of referrals seem to work out better since the current employee puts their reputation on the line for the new hire and that level of commitment often transfers to the new employee. They are currently looking at ways to find qualified former military personnel, as well, since the issue of making sure those who have served the country have job opportunities is one they are passionate about. The company’s move to the San Antonio area, says Moore, is a direct result of their customers growing through the years. “As time has gone on, they’ve grown and so we’ve grown with them, said Moore. “We believe if we don’t grow with them, they’ll tend to find someone else who will, or who already services their combined market.” Much of the firm’s new marketplace is along the I-35 corridor toward San Antonio. To a lesser extent they have also expanded south along I-35. When asked what he thinks has contributed most to the company’s uninterrupted growth, other than that Austin has been an expanding marketplace, Jose had a ready answer: “I think in many areas of life we can tend to overthink things. Sometimes, getting back to the basics is crucial. Number one, I would tell contractors to answer their phone! So many times we hear that contractors don’t call back prospects on a timely basis. “Secondly, no matter what customers say about valuing service quality over price, I think about 85% of the time it comes down to price… and we’re in a cutthroat business. So, in our experience, when we’re able to package so many services together — including sweeping, window cleaning, general maintenance, pressure washing and more — we’re able to have better pricing and provide an unbeatable overall level of service, all while saving them 10% to 15%. It comes down to volume, pricing and packaging. “When 2008’s crash came and the recession hit the business community, our experience was that property managers were even more invested in making sure their centers were well maintained since the competition for customers was so intense. “Our approach was to be willing to cut our prices ten or fifteen percent in the short term but ask them to stick with us when things got better and we raised our prices back to where they needed to be. They did, and I know that some of our customers just put competitors’ bids in the shredder even today. You may reach Jose and Laura Moore via the company’s website, located at MooreCleanTexas.com.